Who Does Our Mexico Belong to? I write these lines with apprehension and fear: apprehension about the process of handing over national sovereignty to our powerful neighbouring nation that has been embarked upon by the government of Enrique Peña Nieto and his allies in the Pact for Mexico, which isn’t just a pact but an alliance with specific purposes. Fear, because that is the feeling that each and every Mexican now lives with regarding their immediate fate, every day, that of their families, their friends, their own person in this land which has been converted into a country without law, and therefore without justice and right, because of the solid alliance of interests between crime and the great national and international financial enterprises. This is the context in which the reform of Articles 27 and 28 of the Constitution appear to hand over the subsurface rights and much of the land and natural resources of the nation to a single bidder, the United States. Oil is a strategic resource, as defined until now by Article 28 of the Constitution. Strategy means “the direction and conduct of a war or wars.” There is no national sovereignty without strategy and without resources to support it and, they in turn, are to be protected by that strategy. To hand over the ownership and control of those resources to our neighbouring country, that means to its strategic needs, or its wars, is not a simple economic decision related to sovereignty. It is to render part of our territorial sovereignty (and sovereignty is territorial or it isn’t sovereignty) to the needs of that power and its multiple and endless wars: that of Iraq, that of Afghanistan, that of Libya; the imminent one of Syria. It is also a great power that has in this century been placed on the defensive in a world whose control is slipping out of its hands. But for now no equivalent power occupies the place it has lost. This military power now controls with its drones, its espionage systems, its spies, its hired agents in our country, and its military and police officially installed in Mexico, whatever happens in this country’s territory and that of others which they are interested in. As for military, that is, strategic matters, Mexico is a territory that is already covered by the U.S. in its foolish but real military plans in response to the current state of affairs in the world. The use in Mexico of the nation’s armed forces–army, navy, air, auxiliary bodies–for internal police tasks, which has been more and more the focus of recent governments, is an operation which, as we know, always destroys morale and an army’s reason for being. Latin America is littered with cases of this progressive corrosion, beginning with Guatemala and the coup against Jacobo Arbenz in 1954, sponsored by John Foster Dulles, to the extreme case of Argentina under Videla and Galtieri, generals who, through the internal war against their people, prepared the defeat in the Falkland Islands of an army with its morale shattered. 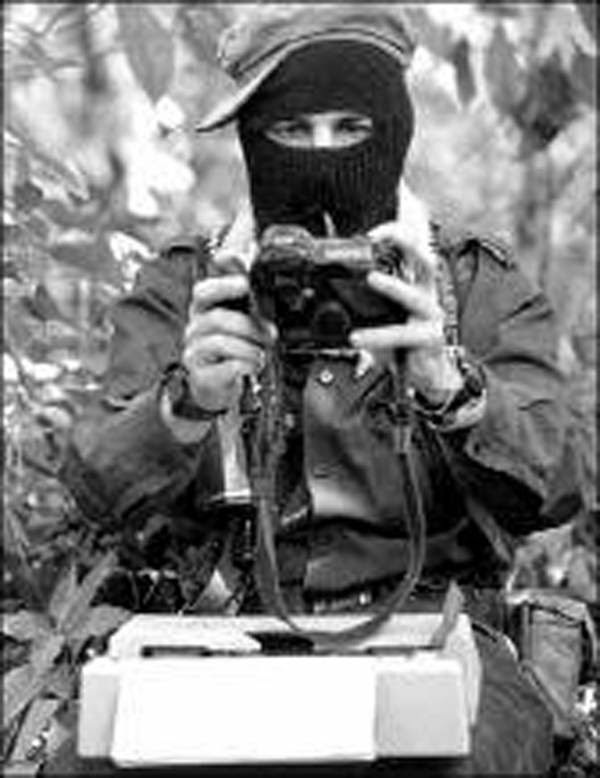 Zedillo’s betrayal in the negotiations with the EZLN [Zapatista Army of National Liberation] and the massacre of Acteal paved the way for the long business of wearing down the morale of the armed forces of the nation. So their job has been, and remains the police tasks of confronting the booming multinational drug industry and, worse still, indigenous and peasant movements, i.e., the oldest and most profound part of Mexico, according to the wise words of Guillermo Bonfil. As the unprotected population increasingly organizes in self-defence against armed crime groups, the governments launch their armies and police to disarm these compatriots whom they don’t protect. Hundreds of thousands of missing and murdered; whole territories where taxes are paid to the drug industry as “dues”; denial of justice of which the case of Alberto Patishtán is today’s national symbol and emblem; stripping union rights via union destruction (SME) or via corruption and charros [government controlled unions] (Pemex workers, SNTE; the list is long). Because of insecurity, the right to move freely about on the country’s roads dissolves; destruction of the nation’s railway system and part of its air fleet; delivery of banking to foreign capital and its domestic partners; complete freedom for Wal-Mart, Dragon Mart, Soriana and like to establish de facto monopolies over entire sectors of trade: this is the process of national disarray now intended to be culminated with the handing over of oil revenues to multinational capital and the needs of our powerful neighbour. Needless to say that this issue opens wide the floodgates for penetration without barriers and with violence by those same private interests into the lands and lives of indigenous peoples and natural resources, and for the destruction of these peoples and their worlds of life through dams and canals and open pit mines, as happens today in Sonora, Chihuahua, Guerrero, Durango. In this maelstrom of dispossession they are also hiding and preparing the assault against the EZLN in Chiapas, the Good Government Juntas, the Zapatista communities and the self-government of indigenous peoples of the region. If this has not yet been let loose, it is because these people are organized and alert and the “bad government”, as they call it, has more pressing issues and fears a chain reaction as there was before. But the threat is still being planned against those lands. A principal part of this subordination of national sovereignty to the needs of our powerful neighbour is that the Mexican government has taken on the task of filtering Central and South American migrants headed towards the territory of the United States, instead of giving a temporary transit document to the undocumented, as had been decided in principle in 2011. Besides, it is the U.S. government that has to solve this problem, because the truth is that it needs the undocumented workforce, but without rights. “But perhaps our Mexico doesn’t belong to us?”, so, in 1988, a farmer in Jalisco wondered in one of the countless letters sent to Cuauhtémoc Cárdenas during his presidential campaign. A quarter of a century later, this unanswered question has been making us more anxious year after year. *Adolfo Atilio Gilly Malvagni (born 1928, in Argentina), is the author of numerous books on the history and politics of Mexico and Latin America, and professor of History and Political Science in the School of Social and Political Sciences at the National Autonomous University of Mexico, where he has taught since 1979. His research focuses on globalization and the Zapatista movement. San Cristobal de las Casas, Chiapas. 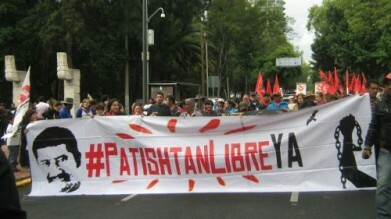 Amnesty International (AI) has called again for the liberation of Alberto Patishtán Gómez, in the context of the caravan which has come from Mexico City to visit him in the prison of this city, and to demand that the court in Tuxtla Gutierrez, who will review his case, rule for his immediate release. “Not one day more without justice”, says the organisation’s blog, calling on people to sign a petition directed to the Federal Judiciary Council which says: “I am writing to express my concerns regarding the judicial process of Alberto Patishtán, sentenced to 60 years in prison. I have learned that during his process there were serious irregularities, and that there is evidence of his innocence which has not been taken into account. “I also know that this is not an isolated case, as those who belong to an indigenous community face serious problems in obtaining justice in Mexico, due to discrimination. 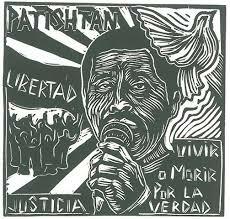 Therefore, I request that the case of Alberto Patishtán be resolved promptly and fairly. “I also request that you take the steps necessary to prevent recurrence of such situations, ensuring equality of process, in which membership of an indigenous group, and economic or social condition will no longer be a barrier to access to justice”. In Mexico, AI concludes, “the justice system fails to ensure a fair and equal judgement, especially when those accused are indigenous.” More than 10,600 people have signed the document ( http://alzatuvoz.org/patishtan/ ). 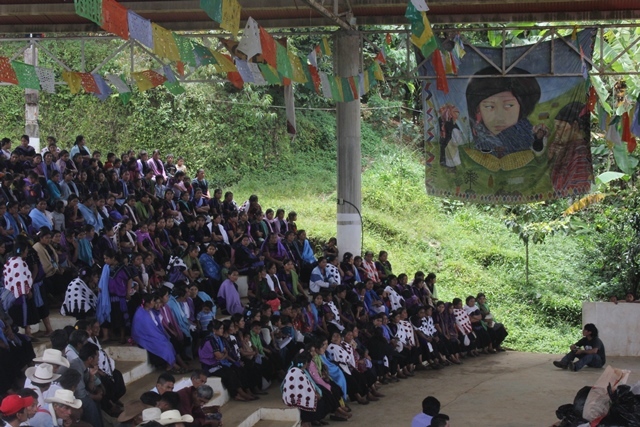 The ejidatarios [communal landholders] from San Sebastián Bachajón, Chilón municipality, have agreed to take to the Supreme Court of Justice of the Nation (SCJN) their case for the defence of their territory against impositions of the Chiapas government, backed by federal bodies, which have involved territorial dispossession of the indigenous, obeying plans for tourist exploitation in favour of the neighboring Agua Azul ejido, where the famous waterfalls of the same name are located. They cite as precedent the protective decision for the Yaqui tribe, of Sonora, on review of the amparo 631/2012, concerning the Independence Aqueduct Project, imposed by the state and federal governments to take the Yaqui River water away from the indigenous peoples of southern Sonora. Members of the civil society organization Las Abejas from Colonia Yaxgemel (Chenalhó municipality), consider the delayed police presence in the colonia Puebla, where the situation is “alarming”, to be dangerous, and they cited the words of Javier Hernández Cruz, an aggressor from Chenalhó parish last week, who said: “We need to warm up the munitions in the sun, since they have been stored for years and have now become cold”, in reference “to the weapons which he and all the Puebla paramilitaries have kept since the Acteal Massacre”. The same individual “has threatened a Yaxgemel catechist with death,” while “other actors” threatened one of the drivers who helped transport the displaced to San Cristóbal de las Casas. “To those of us who suffered the forced displacement of 1997 firsthand, the displacement which our brothers and relatives from Puebla are suffering outrages and psychologically represses us, because the way in which this conflict and the violence there are developing has been identical to the process which led to the dirty war.” The colonia Puebla “is where the first paramilitaries emerged, who extended the conflict and incited paramilitarism in various Chenalhó communities in 1997”. The violence “could have been resolved without displacement if the authorities had the will and the ability to find an immediate peaceful solution. However, it was the opposite”, which is “logical,” because “all the competent authorities are part of the creators of the conflict”. The “complicity of the governments” was confirmed when, in the afternoon of the 22nd, those now exiled, “cornered and threatened with death,” requested protection from public forces to displace themselves, “but it was denied to them”. Nevertheless, once the threatened people had left, “the authorities of the colonia Puebla, those causing the aggressions, requested public force, and it was granted to them”. Now, the police “are already installed” there, “accompanying the generators of violence”. Will we allow another Acteal in Chenalhó, Chiapas? San Cristobal de las Casas, Chiapas, August 28, 2013. 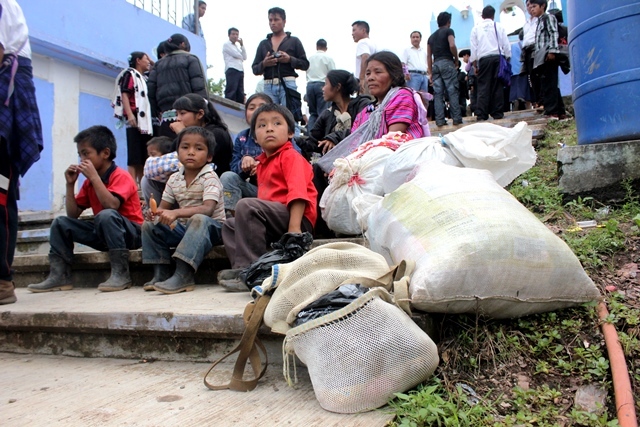 – There are those who still remember that the escalation before the massacre at Acteal in Chenalhó, where 45 people were killed including children and pregnant women, began with provocations and attacks such as those which are happening again today in the colonia Puebla in Chenalhó, where there are already hundreds of displaced people. Although slogans like “Acteal, never again” remain in the collective memory, today those who struggle and the public in general are reacting very little to the new escalation which could result in a new massacre. While some coverage in the free media at the moment is attaining historical reading levels, reports covering the escalation in attacks are reaching very few readers, while the collection of supplies in support in San Cristobal de las Casas is insignificant. As national and international civil society, and as people in struggle, will we allow another Acteal to take place in Chenalhó, Chiapas? The colonia Puebla, Chenalhó, Chiapas, is one of the two places where the paramilitaries who carried out the massacre of Acteal in 1997 came from, and, apart from Jacinto Arias Cruz who was then mayor, the rest of the perpetrators never went to prison, a different case from that of the paramilitaries at the other point of departure: los Chorros, who were tried and imprisoned, and a little while ago were freed by the Supreme Court of Justice of the Nation. Following the release of the latter, and as impunity is now called Justice, the escalation began in Puebla, Chenalhó. If a group can murder 45 people in cold blood, and the Supreme Court of Justice of the Nation will free them, it means that impunity has become law, the highest law of the land. The paramilitary families in the area act accordingly, and send their sons, many of them children, to threaten, harass and stone families not belonging to political parties. The pretexts for these attacks have been various and ridiculous, pure montages. We call on people to remain alert and informed about the situation, to use historical memory not to allow another Acteal, to assist with the collection of supplies, and not to allow impunity to be named Justice again, given the silence of civil society and those in struggle. 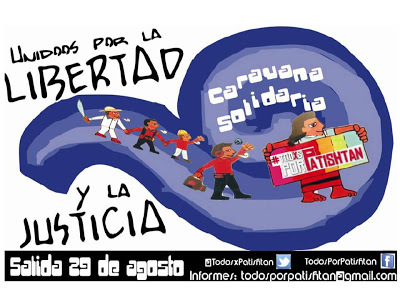 With the demand that the judiciary in Chiapas do their work without further delay, a caravan of dozens of people will leave this afternoon from the Federal District [Mexico City] for the city of San Cristóbal de las Casas, where they will visit the Tzotzil teacher Alberto Patishtán, on the eve of a debate that could release him after thirteen years of imprisonment. Participants in the mobilisation will depart at 5:00 pm from the Monument to the Revolution. The following day they will visit the indigenous activist in the prison of San Cristóbal. Then they will meet with the judges of the twenty-first Collegiate Circuit Court based in Tuxtla Gutiérrez, who are those who will revoke or affirm Patishtán’s sentence of sixty years in prison. After completing this step, he explained, one of the three members of the Court will be elected by their peers to prepare a draft decision within a period not exceeding ten days, which will then be analysed by the other two prior to announcing a final verdict. “Seeing how things are, we are ruling out it being on September 5. We think that it is going to be the middle of the month. We are all very positive, especially me, with our spirits up and hoping that with the caravan, the judges will know who Alberto Patishtán is, who the political prisoner is whose case record they are going to review,” emphasized the young man. “It would be too much if the judges said no (to the release of his father). If this legal route doesn’t work, we have the possibility of a presidential pardon, but we don’t want to come to that,” he said. It is not a calm déjà vu. It is 2013 and not 1997. What is happening in the ejido (previously colonia) Puebla, within the borders of Chenalhó in Chiapas, which they have distorted and tried to present as a religious conflict of some kind, is actually an explosive manifestation of a latent resentment in the families of the paramilitaries which suddenly stokes a contagious and malicious rumour: “They have poisoned our water!” Who? “The Catholics, Las Abejas, the followers of liberation theology”; Who did the first crowd gather against? The Zapatista support bases. They grab three, tie them up, torture them and hand them over to the police. 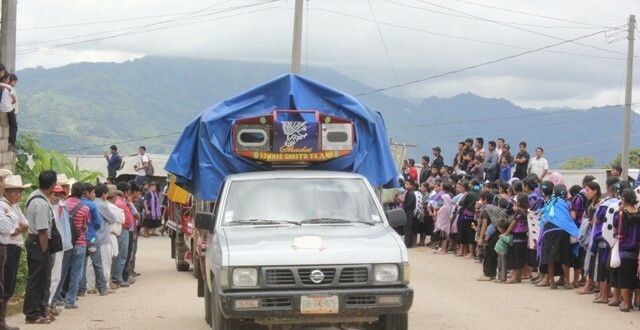 A few weeks ago; now a hundred indigenous, mainly women and children who are not even Zapatistas, walk the painful stations of a non-metaphorical exodus, faced with the unflinching and declarative gaze of the state government which pretends the “conflict” is being “settled” at a negotiating table where the parties are reconciled. We are in the wake of the Acteal massacre. “We did not come here because we wanted to, but because they are persecuting us. They want to kill us, they are organized for that, and the government does nothing”, says Rosa Sánchez Arias this Saturday, close to tears, but courageous, a mother of a family who does not speak Spanish and arrives fleeing. “We did not poison the water. I declare to you that we have done nothing”, she says in a tiny press conference before leaving Nueva Primavera School in San Cristóbal de las Casas, where the displaced spent the night and washed, to travel to the parish school at Yabteclum (the “old town” of Chenalhó), where they arrived that night with the intention of moving to Acteal on Monday. “One place, and another, and another”, Rosa summarizes and laments. On the night of the 22nd the persecuted families decided, and sneaked out early. They went down to the huts of Tenejapa, were covered in mud, scattered, became ill and suffered before being spotted by the civil brigades who were looking for them. That same August 20th a hundred young people and children, with permission to bully, prevented the first people displaced from Puebla from coming closer, in the community itself many more were gathering stones and surrounded the Catholics who were waiting for the returnees. “They threw away the food we prepared, stole the pots and burned everything. They grabbed a girl and were about to beat her. They said dreadful things while they threw everything away. They burned the house”, added Rosa. Dozens of people, imprisoned and besieged in a hut, “felt the smoke and heat of the fire”. The children were terrified, those on the outside were laughing until they cried. Juan, another of the displaced: “Some pastors (evangelicals) are with the aggressor groups. They have spread the word that when we return they will finish us off. If they claim to have the word of God, then why do they do this and want to force us to forgive it all. They do not want justice. They talk of ‘reconciliation’, and the government with them. They forget that they have responsibilities.” They tortured, burned, defiled the priest, and threatened him with death. “And the government says they are just lacking our response to their proposals for the return, without seeing that the criminals are on their side and waiting for us”. From Puebla and los Chorros, the paramilitary game was organized which devastated Chenalhó in 1997, and reached its climax in the camp for displaced people in Acteal on that December 22nd. The dust from the recent release of the convicted paramilitaries (not those from Puebla certainly, for none of them set foot in prison other than the then Mayor Jacinto Arias Cruz) has returned to stir the mud. With a naivety not seen since the government of Julio César Ruiz Ferro prior to the massacre, the government of Manuel Velasco Coello “hoped” that the Catholics would accept an “agreement” that does not guarantee justice or protection, and it has already been shown that the police cannot be or are not with the others. The subject of the rumour is key. According to a neighbour from Yaxjemel, not far from Puebla, weeks ago, “the aggressor group of Agustín Cruz did not have enough support in their crusade against the ‘Catholics’ (although some were not), until the water poisoning”. Never mind that the regional Health delegate, the poet Odysseus Córdova, denied the existence of a case of water poisoning throughout the area, in the very place the concept itself turns and operates. It gives a reason for revenge. Like the Twin Towers. But let no one be surprised. With overwhelming dignity and beauty, the displaced people arrive at night at the refuge of Yabteclum between copal and murmurings like those of Rulfo. The locals who welcome them hear their testimony. Waves of prayers in a Tzotzil lullaby. Then they offer them beans, from a huge griddle full of women’s hands come endless tortillas, and children who have wept for two nights in terror now laugh and eat and run around. Tomorrow they will continue their journey. The nightmares of bad justice beget monsters. Shortly before the caravan was to leave Yabteclum, Las Abejas relate, “a commission of officials arrived made up of a delegate from the Secretary of Government, the State Human Rights Commission, Civil Protection and the municipal secretary of Chenalhó.” They were accompanied by “people who we have well identified as spies or ears of the bad government, taking photos of us.” The governmental commission, “accordingly came to ‘accompany’ and give ‘protection’” to the displaced. “Nearly four months after the start of the problem over the land for the Catholic Church in colonia Puebla, and after the public denunciations, a forced displacement takes place. 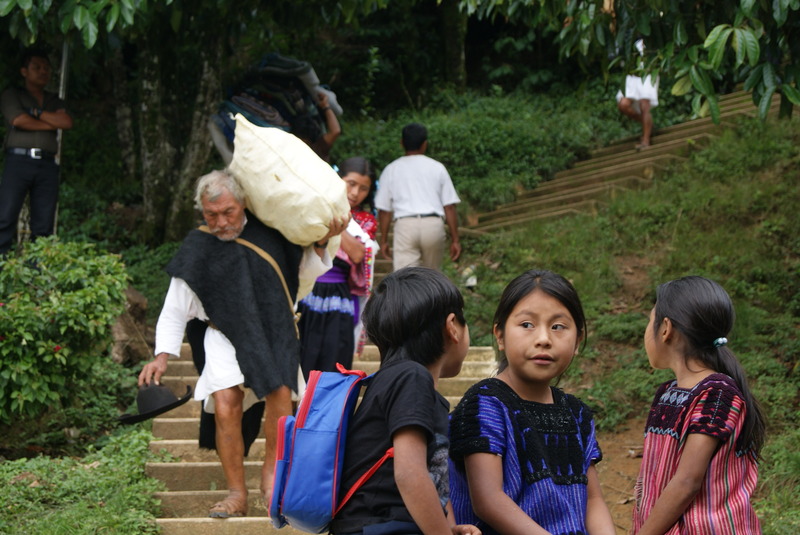 On Monday, August 26th, at noon, we received in Acteal 95 people from 13 Catholic families and two of the Baptist religion, victims of the displacement and the impunity created and paid for by the bad government,” the Tzotzil organization relates. When the commissioner and pastor Agustín Cruz and his followers “realized that reason, truth and justice did not favour them they invented a crime: ‘poisoning’ the community’s water,” Las Abejas point out. “Before this lie, the pastor’s group beat up and threatened to burn three brothers with petrol, and accused and transported them to the prosecutor for Indigenous Justice without any evidence. The aggressor group thought that by inventing a crime they were going to mislead public opinion.” The detainees were released hours later, but they were no longer able to return to their homes. Today, 26th August, the 12 families (70 individuals) displaced from Colonia Puebla moved from the community of Yabteclum, where they arrived on Saturday, to the camp that the Civil Society Organization Las Abejas in Acteal, Chenalhó, had prepared for them. Around 11 am the families left in a caravan for Acteal in the company of various human rights organizations and alternative media. On arriving at Acteal, women, men and children, members of the Civil Society Organization Las Abejas received and gave shelter to the displaced families, all were waiting to receive their brothers to take them to the place that will be their home for now. 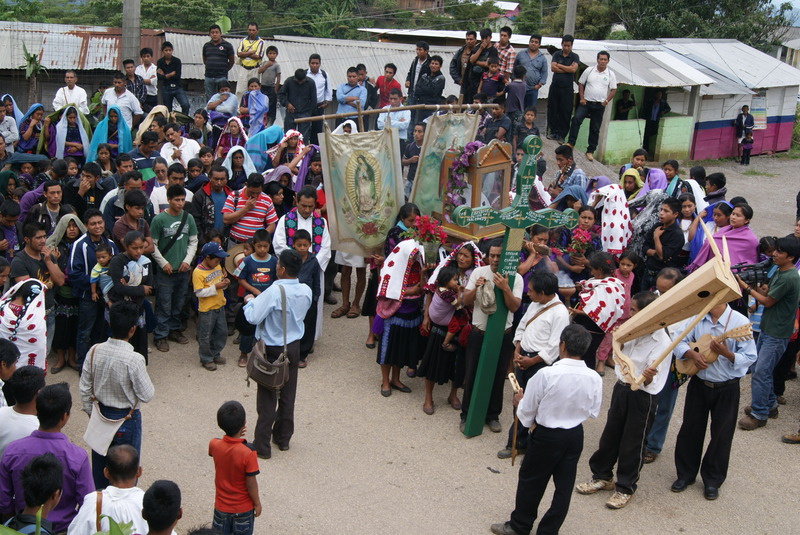 During the Mass held in Acteal, voices were heard demanding justice and an early return to their homes, in addition to punishment for the people who have caused this violence in colonia Puebla. “We as survivors and like the displaced people from colonia Puebla are suffering, just like in 97 when the compañeros were displaced from their communities, they left their communities due to the conflict, here we are remembering very much that December 22, but we are here receiving our compañeros from colonia Puebla, with pain and sadness, but thanks to God the compañeros left their communities, the compañeros sought to leave to find peace” – words of a survivor. The displaced families say they will continue in their struggle, they will continue demanding justice for the events which took place in their community and that they will not stop until those responsible are punished. Through the small bars of the visiting area in the State Centre for Social Re-insertion of the Sentenced (Cerss) Number 5, in San Cristóbal de las Casas, Alberto Patishtán Gómez confirms that he will continue forward with his demand for freedom, despite the government’s failure to fulfil its promises and the systematic delay of his case in the federal tribunals. This Tuesday, on completing seven days of fasting together with Alejandro Díaz Sántiz, his compañero adherent to the Sixth, he will receive a visit from the Commissioner for Dialogue with the Indigenous Peoples of Mexico, Jaime Martínez Veloz. “I don’t know why he is coming,” says the professor, who has spent 13 years in prison (barely one fifth of his sentence); throughout this time he has not stopped struggling, supported by the population of his native municipality, San Juan El Bosque, since 2000, when his prison misfortune began. Nevertheless, until this Saturday, August 24th, his town’s municipal president had never visited him. Remember that it was because of the political intrigue and revenge of the then PRI mayor that he was accused of the massacre of seven police, a crime Patishtán had nothing to do with, as has been demonstrated, and which, as a consequence, remains unpunished. Despite the significance attained by this case, the first collegiate tribunal of the twentieth circuit, a federal body in Tuxtla Gutiérrez which must resolve the request for recognition of innocence presented to the Supreme Court of Justice of the Nation, does not seem to be in any hurry. Sandino Rivero, lawyer for Strategic Defence in Human Rights, pointed out recently: “The visit of Martínez Veloz will take place during the fasting that the professor is undertaking, and a few days from when the case will be resolved; therefore, the message that the federal Executive sends, via the commissioner, will be important.” Rivero said that the official will afterwards give a press conference in San Cristóbal de las Casas. In addition, Patishtán is busy preparing for his participation in the Round Table of the Latin American Congress of Cornell University, with the theme: “Democracy and Dictatorship,” which will be held in Ithaca, New York, on September 27th and 28th. The profe is invited to speak. The escuelita didn’t have formal classrooms with a rigid schedule and teachers imparting their knowledge. Instead it featured immersion based learning, grounded in the daily tasks of constructing autonomy. This included grinding corn, weeding onion crops, collecting firewood, and washing your clothes in the river. All students in the escuelita were received at the CIDECI, an autonomous indigenous learning center based in San Cristobal de las Casas. From there, each student was assigned to one of the five caracoles: La Realidad, Oventic, Morelia, Roberto Barrios and La Garrucha which are the centers of the “Juntas de Buen Gobierno”, which loosely translates to The Good Government reunions. Days before, the caracoles celebrated 10 years of their existence with a grand party in each region. The escuelita was a natural extension of this historic anniversary in which the compas (short for compañero) would not only celebrate their creation, but also impart all the advances they have made in their construction of autonomous government. I was assigned to Roberto Barrios, located in the northern region of Chiapas, close to the historic Mayan ruins of Palenque. Our caravan arrived at 10 p.m. after a long drive through the Chiapan hillsides and jungles. At best we thought a few zapatistas would greet us and that together we would dine with tortillas and beans. 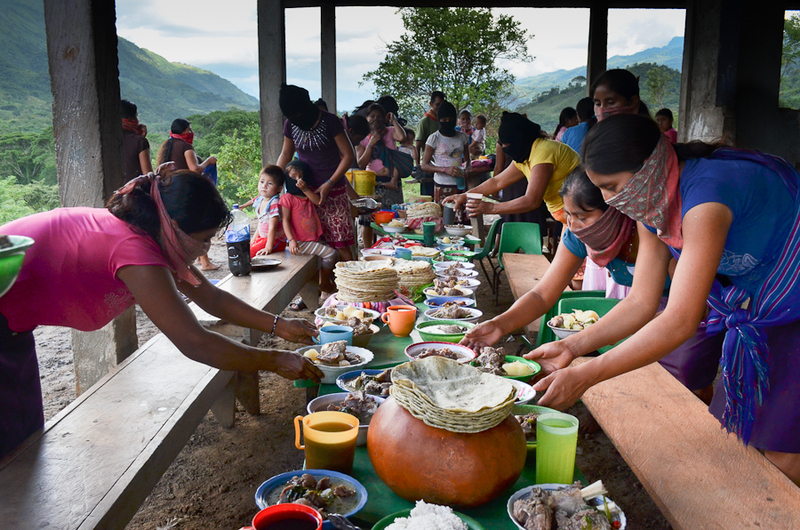 Instead we were greeted by hundreds of zapatistas bearing their trademark balaclavas and paliacates (red paisley bandanas), pronouncing “long live the students and teachers of the escuelita.” Together we sang the zapatista anthem and ate delicious stew. For many of the students, myself included, this was the first time that we had the opportunity to stand side by side with the rebel fighters that had so inspired us for close to two decades. Once we were rested up from our long journey we all gathered together to learn more about the processes of autonomy. Each student was given, for a modest recommended donation of 100 pesos, ) a packet of books and DVDs. The titles were Autonomous Government 1 and 2, Autonomous Resistance and The Participation of Women in Autonomous Government. 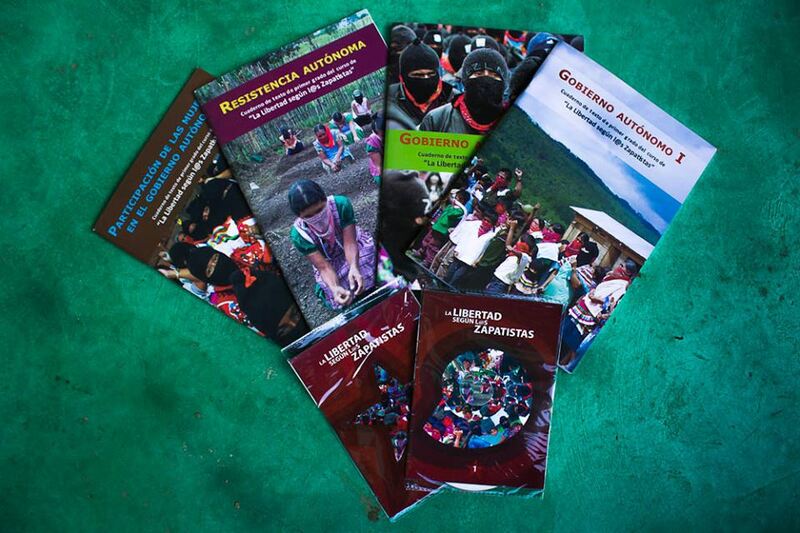 As with most projects in zapatista life, they were produced collectively by compiling the stories of members of the communities in the five distinct regions each governed by their own Caracol. The teachers who helped draft the books, introduced us to them explaining how the 3 levels of zapatista government work on the local, municipal, and zone levels. 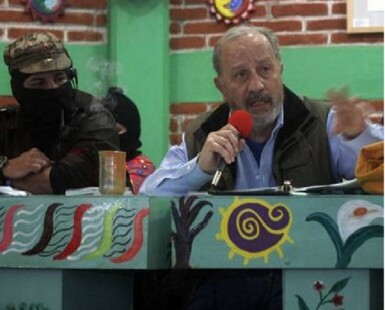 The government representatives are chosen from all zapatista municipalities and serve three year terms. 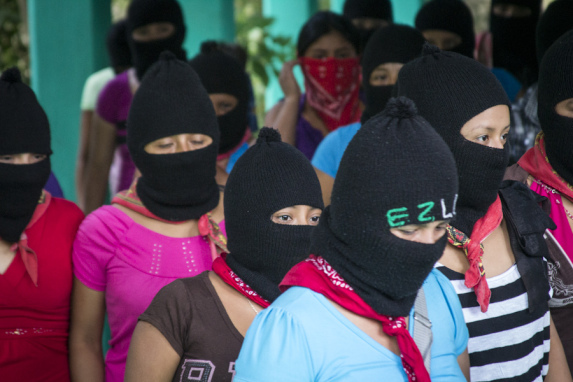 There is a strong desire for gender equity in the Juntas de Buen Gobierno, yet the zapatistas acknowledged that they are still struggling in that area and that the majority of the representatives are male. The zapatista bank was formed so that when a compañero or compañera gets sick they would be able to obtain a loan to pay for medical costs and pay back the money with a very low interest rate, and in the case that they die, the family does not have to pay back the loan. While these lessons were shared formally from the Caracol stage, the true teachers of the escuelita were the Votánes. Each student was assigned their own Votán- also known as a guardian- who would accompany through the entire learning process, and serve as a translator from Tzeltal, Tzotzil, Tojolabal or Chol, into Spanish. It is important to note that the majority of Votánes were younger than 25-years-old, meaning that they were born, or at least raised after the ‘94 uprising. The “other world” that we dream of constructing, is the only world they have known. They breathe and live autonomy, with a profound sense of collectivity and the education that has been bestowed on them from the autonomous zapatista schools. Each student resided with a family in a different zapatista community, accompanied by their Votán. Some communities were what many would call “utopian” with solar power, composting bathrooms, extensive food cooperatives, and well-constructed houses. Some communities were located right off a well paved highway and some were only accessible via a four hour hike through the jungle, crossing rivers, where there was no electricity or running water, besides local creeks. Some communities were exclusively zapatistas and others a mix of zapatistas, “partidistas”, what the zapatistas call those of civil society who believe in the political party system and paramilitaries. Our community, Comandante Abel, located in the municipality La Dignidad, was accessible via a muddy highway, which allowed us to advance at a maximum 1km an hour. It led us into a lush green valley full of corn dotted hillsides. Entering the community we crossed the beef cooperative where all members of the community tend to the land and take turns carrying for the health of the cows. Beyond the cow field was the elementary school, that serves all the youth of the community teaching basic skills and zapatista concepts of autonomy. 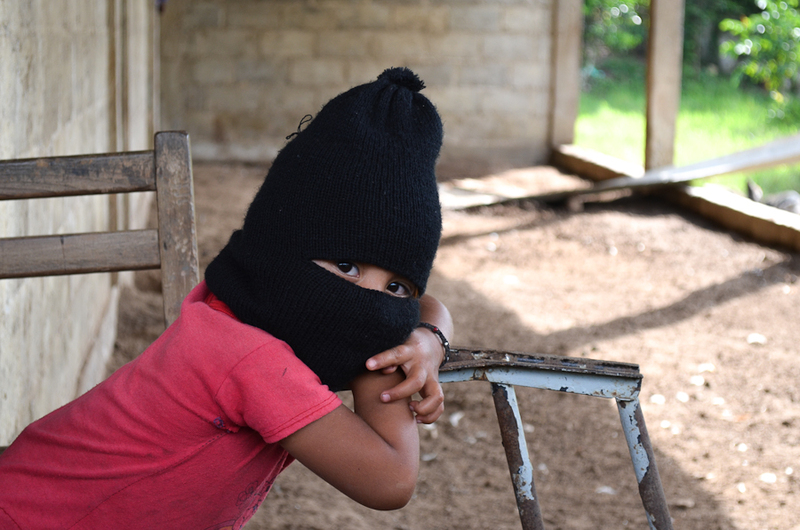 Comandante Abel is an exclusively zapatista community that lives under constant threat of the paramilitary group ironically named Peace and Justice. While most students stayed with families, the security conditions were less than favourable in this community and us 20 students and Votánes stayed in one building together for safety concerns. Cell phone service doesn’t reach this area, but the Zapatistas have an internal radio system for emergency communication. In the morning we headed out into the fields. We weeded an onion field, harvested yucca, sugar cane, and corn, and picked mandarin oranges and grapefruits. My Votán Rosario explains to me, “this is how we pass our days, we wake up and head to the fields to look for our daily sustenance, to harvest what our family will eat that day.” Talk about “fresh”, “local”, “seasonal” and “organic”- the zapatistas have it without the special terms. Little is prepared on the firewood stove that wasn’t harvested that day from the fields. Tortillas are made daily which entails harvesting the corn, shucking it, plucking the grains, cooking the grains with cal to start the process of nixtamalization, hand grinding it, and kneading and flattening it by hand. The following day the students, guardians, and all members of the community heading to the cow fields to sharpen our machetes and hack at the weeds. Cleaning the cow field by hand would have been an impossible task for a few people, but many hands make light work and it is the zapatistas cooperative spirit that allows grand projects like this to be possible. It is this collective force and the fruits of their cooperative labor that made the escuelita possible. Furthermore, this school wasn’t funded by some elite foundation, an NGO, the Basque government, or some Italian solidarity group. All of the labor to pull off this enormous endeavor was donated whole-heartedly by the compas who pooled money from their cooperative endeavors to fill the gas of the 100+ transport vehicles and pooled food to fill the stomachs of all the participants. 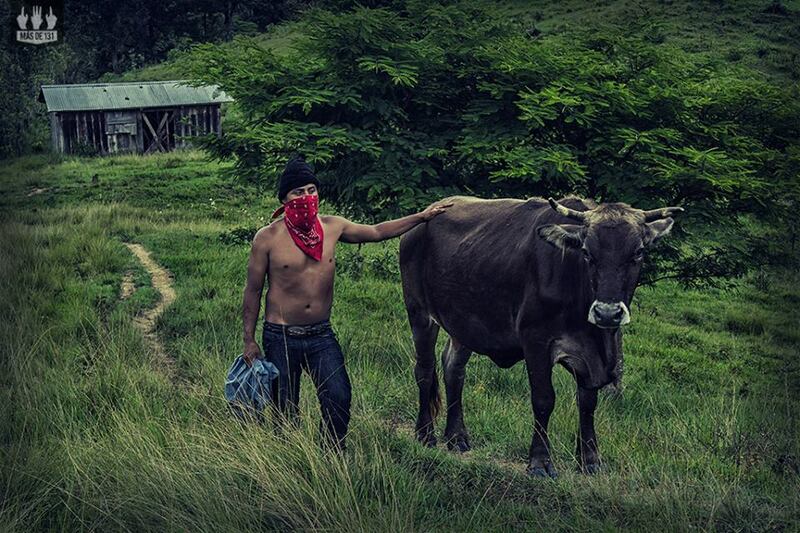 Living along side the compas for these few days gives us the smallest glimpse into the reality of life as a zapatista. While driving to the community we are stopped at a military checkpoint, which dot the entire state of Chiapas, and while we are only asked basic questions and held for 15 minutes, it gives us a little insight into what its like to be part of an insurgency living in a heavily militarized zone. We had a meeting with the entire community and in their native language Chol explain to us the history of the community. In a communique Subcomandante Marcos explained why we could only understand what the community said via our Votán. The community leaders of Comandante Abel explained how on September 6, 2012 heavily armed paramilitaries arrived at the corn fields and evicted the zapatistas. One woman recounted how they had to take refuge in surrounding hillsides, carrying numerous children in their arms. They explained how this displacement created food insecurity as they no longer could access their crops that they had cultivated for years, and were left with nothing to feed their children. A beautiful river runs alongside the community, yet the community can’t access it, and instead are forced to wash their clothes, dishes, and corn in a muddy water hole or small creek. While we celebrated our last night in Comandante Abel with a big feast from the cow that was just killed for us from the cooperative, we glanced over to the neighboring hillside where the paramilitaries have erected a bright red flag. Last time they erected one flag, followed by two more, once the third was erected they attacked the community. The zapatistas did assure us that we could not be zapatistas, nor live in their communities, but perhaps for many of the students that was not their intention. For some, the intense labour we participated in to provide one’s daily sustenance broke some of the romanticisation of life in zapatista communities. But, the zapatistas have never asked us to adopt their way of life. What they do ask of us is to stand with them in their struggle and that for “each of us struggle where you are and construct your own autonomies where you can. 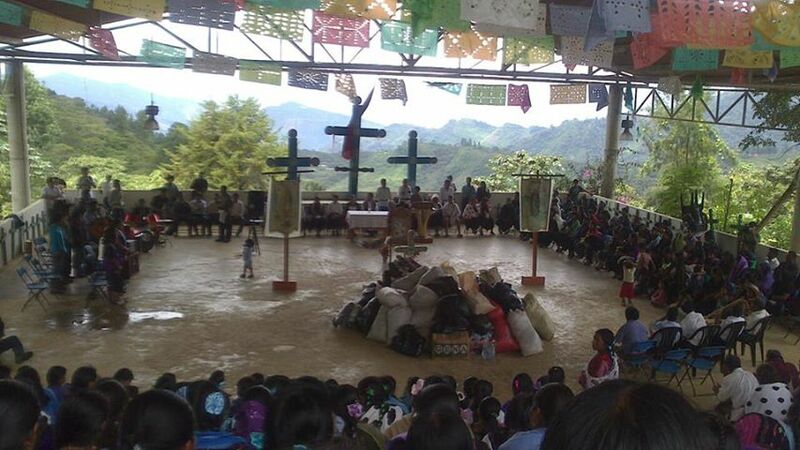 Dozens of civil society organizations in the country made pronouncements today about the aggressions and displacements suffered by dozens of Tzotzil families, the majority of them Catholics, from the ejido Puebla, in Chenalhó. More than 70 groups from the All Rights for Everyone (Todos los Derechos para Todos) Network, as well as the Foundation for Justice and the Democratic State of Law (Fundec, its Spanish acronym) and other human rights centres from the north and centre of the Republic, who echoed an urgent action issued on Saturday by the Fray Bartolomé de las Casas Human Rights Centre (Frayba). Meanwhile, in Yabteclum, the displaced who arrived here last night announced that this Monday they would move to the encampment in Acteal community. 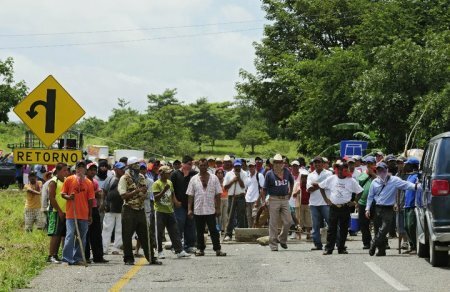 “We want to clarify that although we are sheltered here, our hearts and minds are in our village which we had to abandon, because the threats and aggressions were already against life itself.” It is expected that indigenous from Los Altos and a solidarity caravan from civil society will accompany them. The Little Zapatista School, for which more than a thousand students went into autonomous communities, was a different way of learning and teaching, without classrooms or blackboards, without teachers or professors, without curriculum or qualifications. Real teaching begins with the creation of a climate of fellowship (hermanamiento) among a plurality of subjects, though previously with the division between an educator with power and knowledge, and ignorant students in whom knowledge must be inculcated. The first is that the Zapatistas defeated the social counterinsurgency policies, which are the way found by those above for dividing, co-opting and submitting peoples that rebel. Side by side with each Zapatista community are communities related to the bad government with their little cinder-block houses, who receive cash certificates and hardly work the land. Thousands of families succumbed, something that is common everywhere, and accepted gifts from above. But, what iss notable and exceptional is that thousands of others continue forward without accepting anything. I don’t know of another process in all of Latin America that has been able to neutralize the government social policies. This is a major virtue of Zapatismo, attained with militant firmness, political clarity and a never-ending capacity for sacrifice. This is the first lesson: it is possible to defeat the social policies. A couple of words about the economy, or the material life: the families from the communities don’t “touch” the capitalist economy. They hardly border the market. They produce all their own food, including a good dose of proteins. They buy what they do not produce (salt, oil, soap, sugar) in Zapatista stores. They save the family and community surpluses in cattle, based on the sale of coffee. When there is a need, for health or for the struggle, they sell a beast. Autonomy in education and in health are placed in the community’s control. The community elects those who will teach their sons and daughters and those who will care for their health. There is a school in each community, in the place for health midwives, bonesetters and those who specialize in medicinal plants work together. The community sustains them, just like it sustains their authorities. The fourth question is the new political culture, which is rooted in family relations and permeates all of Zapatista “society.” Men collaborate in the domestic work that continues to fall on the women; they take care of their children when the women leave the community for their work as authorities. The father-son relationships are affectionate and respectful, within a general climate of harmony and good humour. I did not observe a single gesture of violence or aggressiveness in the home. It is the first time that a revolutionary movement has carried out an experiment of this kind. Until now the learning among revolutionaries reproduced the intellectual models of academia, with an above and a below stratified, and frozen. That is something else. We learn with skin and senses.